Our skirting boards exemplify traditional wood craftsmanship, enabling original features of period properties to be retained and restored. Compliment the fine interior details found in Edwardian properties with a historically accurate skirting board. Crafted from the highest quality Pine, Oak, Tulipwood or Sapele, you can be sure Period Mouldings skirting boards are of the upmost standard. Creating a range of stunning, traditional skirting boards including Georgian skirting boards and Victorian skirting boards. However, if you have a more modern property, we also craft Contemporary skirting boards. 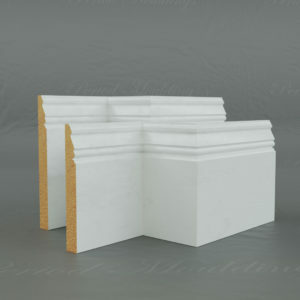 So, whatever your skirting board needs, Period Mouldings have you covered from 1714 to the present day! We also offer a bespoke crafting service, so don't hesitate to contact us if you cannot find the perfect item among our catalogue.